People say seeing is believing; what you see is what you believe, which holds true for a lot of things in life, including the products you buy. Samsung, a brand known well for its innovativeness, takes this one step further. Welcome to Samsung Experience Store, a place where you see, touch, feel and experience before you buy. On 11 October, 2012 Samsung launched its 32nd Experience Store. It is located in Road 114, Gulshan- 2, Gulshan Avenue. Choon Soo Moon, Country Manager of Samsung Bangladesh, inaugurated the experience store. Superior service is one of Samsung's guiding visions throughout the world. An experience store is one of the ways through which Samsung achieves that. For example, a team of dedicated Samsung Product Consultants (SPCs) will always be there at the store to aid the customers, be it for information or to try out the products. The store will have all the mobile phones of Samsung that are available in Bangladesh for you to experience before buying. The outlet offers you a premium, unique experience, involving “touch and feel”, so that you can actually make an informed decision. Mobile phones may sometimes cost quite a bulk amount, and a mobile handset is, in a way, an extension of you -- given that you seem to be using it all the time. “The Samsung Experience Store will allow consumers to have a hands-on experience of all the latest innovations that Samsung mobile brings to Bangladesh. In future, we hope to open more such establishments across the country to deliver more convenience to the consumers,” Choon Soo Moon, Country Manager of Samsung Bangladesh, said. The store will also strive to maintain one-on-one customer relationships, record feedback and use consumer insights to deliver even better products and services. Hence, if you are planning to buy a mobile phone, or are at least keen on checking out the latest Samsung products, do visit the experience store because experiencing is believing! Talking about what's below the belt, folks. And what's below the belt is a set of muscles that are almost as elusive as a golden deer. The lower abdominal muscles are a common problem area for both men and women. Even after losing significant amounts of weight, many people still have flab in this area. What to do? Go into reverse mode. A reverse crunch is a floor exercise intended to work your abdominal muscles. This exercise is a popular choice for those wanting to tone their lower abs. Reverse crunches, when combined with diet and fat-burning exercises, provide a reliable way to work the lower abs and achieve a tighter, flatter abdomen. When performed properly, this exercise can actually work the whole belly, though it is most effective for the lower abdomen. Starting position: Lie on your back on a mat with your knees bent, feet flat on the floor and arms spread out to your sides with your palms facing down. Gently exhale. Engage your abdominal/core muscles to support the spine. Slowly lift your feet off the floor, raising your knees directly above your hips. Bend the knees to 90 degrees. Hold this position and breathe normally. Use your arms as a base of support. Upward phase: Exhale, and slowly raise your hips off the mat, rolling your spine up as if trying to bring your knees towards your head. Avoid any change in the angle of your knees during the roll-up. Use your arms and hands to assist with maintaining your balance and continue to curl up until your spine cannot roll any further. Hold this position briefly. Downward phase: Gently inhale. With control, lower your spine and hips back to the starting position. Proper form is important when performing this exercise to prevent excessive stress on your lower back. When returning to your starting position during the repetitions, control your leg movements. Do not allow your knees to move past your hips, but instead return to a position directly above your hips. Since the abs connect the rib cage to the pelvis, the emphasis of the movement should be on pulling your pelvis upwards, towards your rib cage. What you shouldn't expect: Many people expect reverse crunches and other abdominal exercises to flatten their bellies, but they soon realise that exercising the abs isn't enough. Basically, you'll need to burn off the layer of fat over the abdominal muscles. After the fat is gone, your stronger, tighter abs will be visible. If you don't make smart food choices and don't perform fat-burning exercises, such as aerobics, you probably won't see major results from crunches. 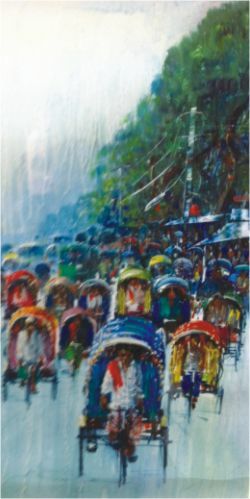 In a little green magic box, with three wheels and the sound of an engine which celebrates its survival every living moment with a broken voice, a CNG driver and his passenger rode down the streets of Dhaka. The passenger in her sari looked up at the sky, cloudy, grey, melancholy. The last hour was spent in contemplation, the sky's contemplation to break down and the earth's to cleanse its tinted dry skin. The darkness of midmorning wrote a song for rain. After listening to half the song, Monsoon, who is quite easily swayed, poured down extending his stay in the land of Bengal. No corner was left untouched; all curves were adored and showered with ample kindness. People who ran in to seek shelter were branded straight-laced right on the spot; the ones who were bewildered, half-soaked and half-dry were understood to be living on the edge, and the ones who intentionally stood on the streets, concealing smiles, drenched under the open sky were labelled poets and narcissists. The passenger in the CNG was unable to belong to any of those categories. She was stuck in the magic green cage. The plastic curtains were rolled up, not to be used for protection against the over-expressive Monsoon. The corner of her sari collected drops of puddles from the street, courtesy of the fast moving cars and their conceited splashes. The raindrops landed on both sides of her, making the green of her sari greener. She noticed the fidgeting of the CNG driver. He wore a dark blue shirt, the usual lungi, only part of his face was exposed to the side view mirrors, where both passenger and driver were framed like some artistic photograph. The CNG driver pulled out a Bengali newspaper which he had kept next to his seat. He put it behind him. A minute later as few of the stormy drops reached his back he grabbed the paper from behind him and opened up that secret hole next to the steering wheel that all CNGs seem to have (the passenger has always been curious about what treasures remain in those cubby holes) and stuffed the newspaper in there. Two minutes later, as if having an afterthought, he opened up the secret cubby hole and put the newspaper on his lap. The passenger wondered what that newspaper held that the CNG driver must protect with so much care. Was it news of his village, a murder of a distant someone, HSC results, the rising price of gas, women seeking men, men seeking women, a flat for rent, a job to be filled? What was it, she wondered, as the rain pretended to stop only to pour harder seconds later. When they arrived at their destination, the passenger gathered her half-wet sari, brushing the sides of her hair she looked at the side-view mirror. The CNG driver was examining the newspaper, it was completely dry, probably the only item which was untouched by one of the last dances of Monsoon. No change was necessary to give back to the passenger, she opened the gates of the little green magic cage and stepped out. Locking the gate behind her she looked at the CNG driver again, he had opened up his newspaper, taking pleasure in every headline. And that was how that morning ended -- a billion drops of rain, splashes, puddles, dry newspapers, a CNG driver, a passenger, all in the little green magic box.